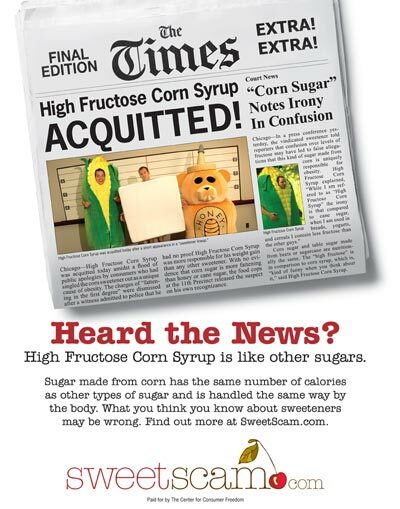 The Center for Consumer Freedom group is at it again, but this time defending the very popular, but wrongly accused ingredient, High Fructose Corn Syrup. CCF’s website, SweetScam.com is serving as a watchdog for the numerous attacks on HFCS by providing statistical information using sound science and professional expertise. A strong voice is needed as companies are centering advertising campaigns on the removal of an ingredient that is not actually improving the health of their product, but simply a marketing tactic. Most notably Starbucks has completely removed it from their menu and Pepsi-Cola is experimenting as well. These marketing messages aren’t necessarily making claims against HFCS, but still put negative ideas into the average consumers’ mind. SweetScam. com looks to dispel the false rumors, claims and myths against the widely used sweetener by informing folks with the factual information that they deserve. 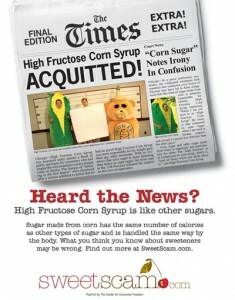 This entry was posted in Education and tagged Center for Consumer Freedom, Consumer Reports, HFCS, High Fructose Corn Syrup, sugar, SweetScam.com.